Innovative design, durability, high performance, and low maintenance requirement are the features of our Automatic Metal Spraying Machine. If you want to know more relative information about Metal Spraying Machine, please contact us immediately. Incorrectly selected spray equipment can cause severe damage to end faces of the windings and produce unacceptably high power factor capacitors. 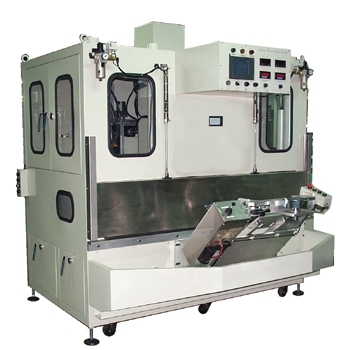 The AUTOMATIC METAL SPRAYING MACHINE is designed through our comprehensive research and accumulated ten-year of experience; as the requirements of regarding above specially performance of metal spraying in metallized film capacitor. By using DC electric ARC system, sprayed metal particle is very fine and strongly adhered to film surface which enables you to produce high qualified uniform capacitors. Closed shut system can improve the working environment wth no noise and no dust in the metal spray room. Gun Move → Elements Turn → Air Shower → Spray Start → Spray End → Air Shower → Shutter Open. Elements setting apparatus enables safe elements input and avoid products damage. R.P.M. between border and center of disk, metal sprayed thickness is very uniform at any point. Gun is operating only when the elements disk is arrived at spray position and it can save material consumption. Spray distance can be adjusted by remote control system in order to get the best spray condition. Spray Wire Material Zinc, Lead, Tin Lead, Tin Copper, etc.